Pure spring alchemy is all around. It steps out with first warm days and long-awaited sunshine. Spring time is for everything fresh and renewed, and a new look for your web project turns up just at the right moment. 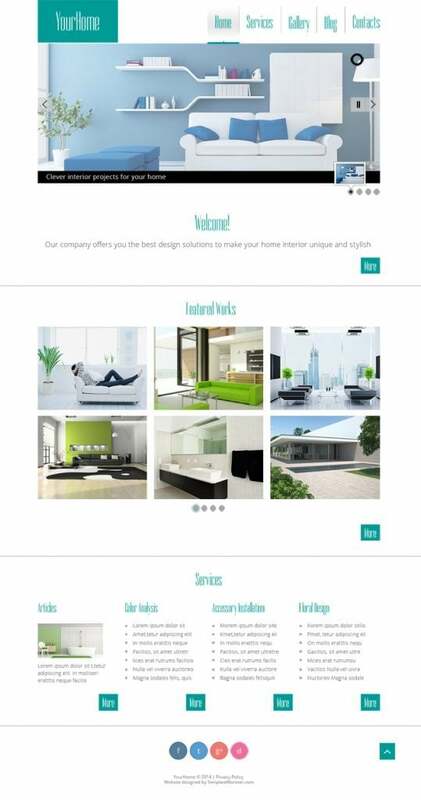 Just released Free HTML5 Theme for Interior Site in a fresh Persian green color, is a ready-made design with refined tone for any website dealing with interior, exterior, architecture, design, beauty and striving for clean modern look. This theme is created with minimal approach in mind, so you can be sure that any website based on it will welcome visitors in with refined aesthetics that is its definitive part. White background and light green (Persian Green - #009b97) are perfectly balanced, creating a visually appealing contrasting look. The theme is nicely tailored for communicating creative ideas and solutions of studios offering interior, exterior or any other designs. Ultimately sleek, well-structured, this theme goes with a pack of must-see features. If you are one of the mentioned above organizations or one of volunteers who help them, consider this theme as a basis for a site showing people working together in the charity community. It’s completely free theme, so you’ll not spend extra funds for setting up a site. Wallet-friendly and well-coded, it is what you need to start a solid web presence. Want to feature nice visuals of the top works with short descriptions? Make use of a Camera slideshow, free jQuery plugin. Large slider with captions, that you see in the header of this theme, is created with its help. Make visitors interested in a gallery of your featured projects implementing nice transition effects into it. Animations for Thumbnail Grids will help present a list of works with fancy visual effects, so the viewers will enjoy browsing it. Being placed into the central part of this freebie, these thumbnails intensify the viewing pleasure of the whole design. Please note the circular multicolored social buttons with tool tip effect in the footer. They will make your site social media ready (you don’t need to look for any other solution of this kind) their unusual look invites viewers to visit various company’s accounts on the web. Be sure click live demo button to see it in action! Feel free to share in the comments links to your sites made on the basis of this free theme. I wish you inspiration, ultimate creativity and trendy designs.